I've noticed that kids these days don't seem to be as familiar with all the old folk/fairy tales, nursery rhymes, and songs (though there are exceptions), so in the interest of cultural literacy, I decided to focus on "Folk Tales" for today. I make a distinction between folk and fairy tales, though they are often used interchangeably. 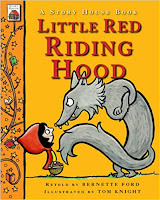 I think of "folk tales" as being the old stories that often have a lesson or moral to them, but generally don't involve magic or fantasy; think Little Red Hen, Chicken Little, Little Red Riding Hood, Three Little Pigs, Goldilocks, The Enormous Turnip, etc. I think of fairy tales as the ones that involve magic and fantasy, the ones with fairies, witches, fairy godmothers, damsels in distress, and the handsome princes or knights in shining armor that rescue them, and don't necessarily have a moral; think Cinderella, Snow White, Sleeping Beauty, Beauty and the Beast, etc. 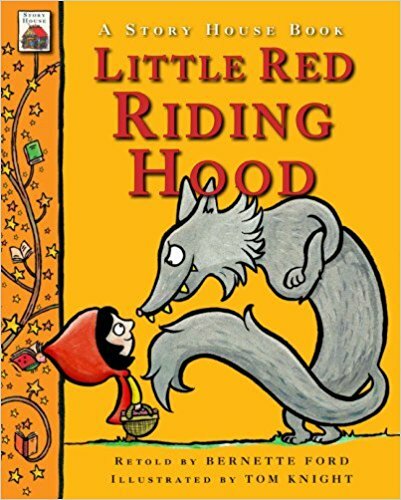 I happened to have a Little Red Riding Hood costume, so I wore the hooded cape and carried my storytime books and stickers in a basket instead of my usual tote bag. At first glance, I think the kids thought I had made an unfortunate fashion choice, but a few of them quickly put it together and exclaimed, "You're Little Red Riding Hood!" We started with our welcome song, then I asked them if they knew who I was, and by then they all knew I was Little Red Riding Hood, then I asked them what kind of goodies did they think I had in my basket, and they promptly said "Books! And stickers!" I then asked what did they think one of our stories was going to be, which of course they guessed right away. Then I explained how LRRH was a folk tale, and that folk tales were stories that had been around for a very long time, even hundreds of years, and often were used as a way to teach children an important lesson. I explained that these tales were told over and over and that everyone told them slightly differently, so there are many versions. Then we sang our story song and settled down for the first story, which of course was Little Red Riding Hood. I chose this version by Bernette Ford and Tom Knight (part of the Story House series) because it was short and simple, had simple, bright illustrations with heavy black outlines, and was not as gruesome as some others (yes, you, Lucy Cousins with your bloody wolf's head flying across the page 😏), though I did think the part about wolf's abdomen having a zipper was a little silly (I just said the woodsman opened up his stomach, didn't say how). I also like how it spells out the warning about not talking to strangers. The kids enjoyed it so much they just wanted to go straight to the next book, so we did. I chose Harriet Ziefert's version of The Gingerbread Boy (illustrated by Emily Bolam) because, again, it was the only one I could find that was short and simple enough for three-year olds. I did make two slight changes to make it more participatory and more in line with the way I remember the story. While Ziefert only has the gingerbread boy saying his famous line "Run, run as fast as you can. You can't catch me - I'm the gingerbread man!" only once, I had him say it after every encounter so the kids could be more involved in the story and say it along with me, since they all knew it. I also had the gingerbread boy moving up to the fox's back, head, and finally, nose because he was still getting wet, because that's how I remember it, and I think it makes more sense than him being heavy. Before the final we story, we took a break to do a few traditional childhood songs and nursery rhymes. I started with "Mary Had A Little Lamb", using all the verses, then "Little Bo Peep" for another one with sheep. Then one boy asked to sing the "ABC's", and I suggested "Twinkle, Twinkle, Little Star," pointing out that they both use the same tune. Then a little girl requested "Itsy, Bitsy Spider" and I followed that with "Little Miss Muffett" before moving on. 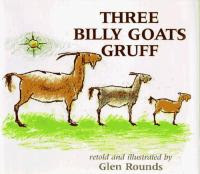 For our final story, I chose Glen Rounds' version of the Three Bill Goats Gruff. This version seemed to have the least text, and the most straight forward telling of the story of the several versions I looked at, and the illustrations are not too pastel or busy, and clearly illustrate what is going on. They are a bit dark and minimalist, but I think that helps convey the seriousness of the situation. The kids can join in saying the "trip, trap; trip, trap" and these didn't need any prompting. This story has lots of drama but no gore and is a lot of fun to read aloud. We ended with our closing song and passed out stickers. This storytime went really well! The kids were really into the stories, and we all had a lot of fun. They seemed to be more familiar with them then I expected, and I even had to keep cautioning one young man not to give the endings or twists away in his enthusiasm. I think almost all, if not all, were familiar with Little Red Riding Hood and most appreciated my dressing the part. The little boy I mentioned above was so exited about the story, and just could not wait for the big, bad wolf to make his appearance! They were relieved Red and Grandma were unharmed in the end, and we discussed the lesson she learned about talking to strangers. They weren't quite as familiar with The Gingerbread Boy, but when we got to the part where he says his famous line, they started joining in and seemed to recognize at least that part. The same little boy couldn't wait for the fox and almost gave the ending away. 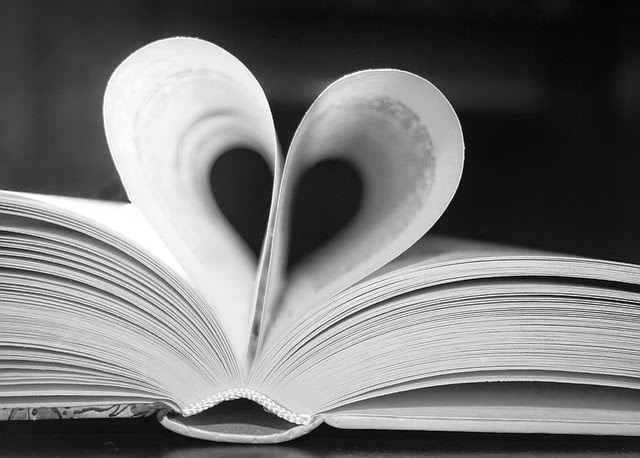 It was so cute how excited he was; he face was lit up with a smile and bright eyes, and he was practically quivering in anticipation of the dramatic moments in each story. We decided the moral to this story was to always listen to your grown-ups, and to never run away. Though they liked all the stories, I think they loved the Three Billy Goats Gruff! I think partly because it wasn't as familiar, so the drama was more palpable, and the loved the different voices, especially the loud, grumpy troll. This one was definitely the most fun for me as the presenter, and they all joined in right away with the "trip-trap"s and also with the troll saying "I'M GOING TO EAT YOU UP!" each time. I'll have to do another day of folk tales for them sometime with some of the lesser known stories.